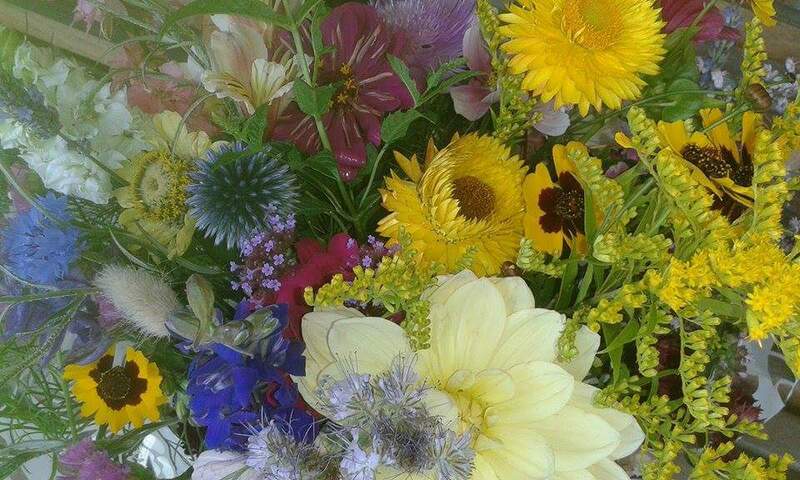 Is it time to support locally grown, small scale cut flower growers? The cut flower industry is huge, and with few exceptions, uses a lot of chemicals. 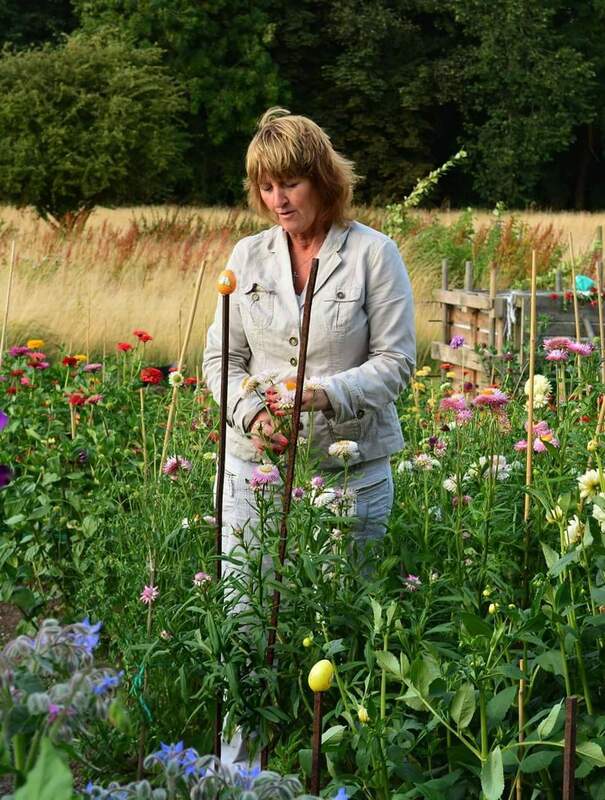 In an interview with Sandra Bright, we discuss with this British grower how growing gorgeous flowers for cutting and selling locally, is helpful for bees, pollinators and other wildlife. 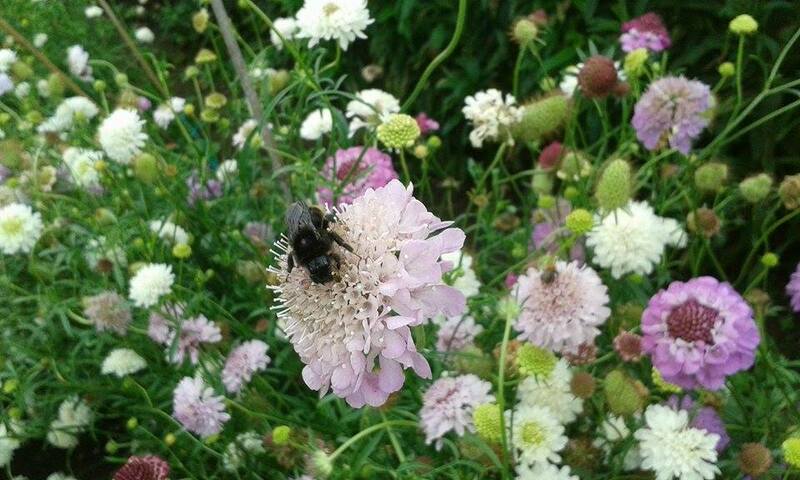 Sandra tells us a little about her experience of growing flowers for cutting, supplying weddings and bouquets, and running a small cut flower hobby business, as well as the wildlife visitors to her plot. Increasingly more brides in the UK are wanting British grown flowers for their weddings, but not only that, the public are wanting them in their vases at home. When you see these beautiful pictures of wedding bouquets and arrangements, all made using flowers from Sandra's plot, you’ll see why! Sandra is a keen gardener, and appeared in the BBC’s Allotment Challenge in 2015. 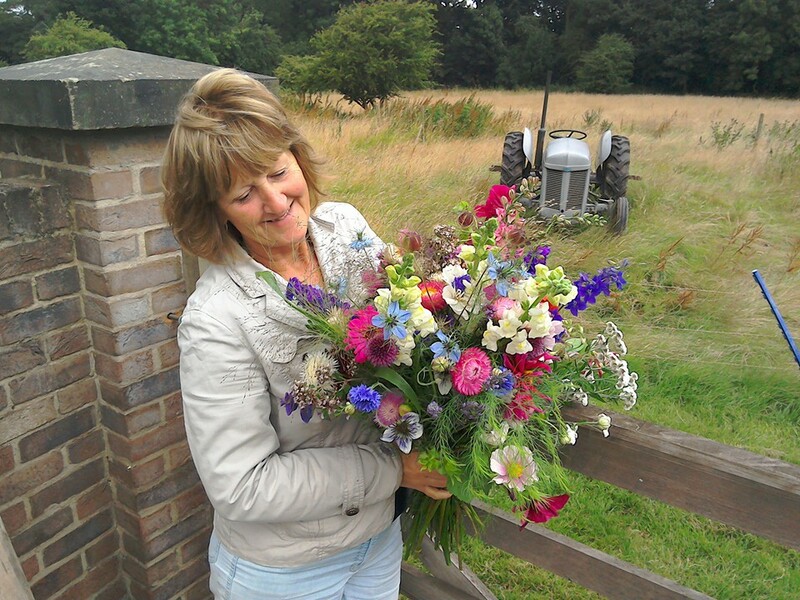 Above: Sandra Bright with one of her creations: a lovely bouquet of English cottage garden flowers all grown from her own plot. However, it’s not just in the UK that this trend is emerging – we’re also seeing small scale growers popping up in the USA. More about that in another blog! 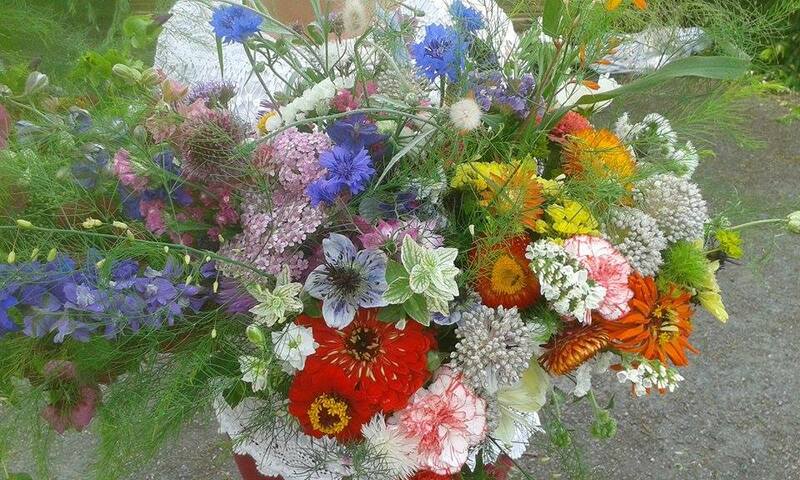 Above: An absolutely stunning vase of flowers all grown on Sandra's plot. Who would have thought we could get such a gorgeous display of this quality from British grown flowers? 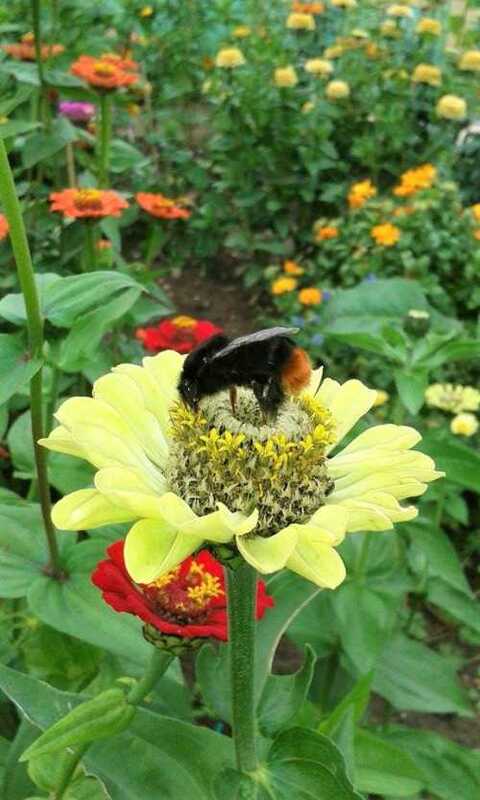 But anyway, the main reason this is of interest to me, is because of its potential benefits for the environment and wildlife (especially bees and other pollinators), particularly when low-impact, small scale cut flower businesses start to take a share of the cut flower industry. 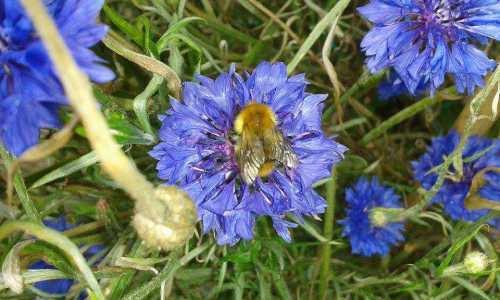 If more people in the UK start to supply flowers on a small scale, then more pollinator habitats will be created by default ! What we don’t want to see, however, is a replication of intensive, high chemical methods dominating the Dutch growing industry. If you are wanting to buy British grown cut flowers for your wedding bouquet, a gift, or simply for your own home, there are some suggestions within this article. If you have ever thought about growing flowers for cutting, perhaps selling cut flowers at a farmers' market, or supplying a florist, then hopefully you'll find this interview inspiring, and there are some useful pointers further down this page. There is also a list of the best flowers for cutting and growing in your garden, and tips on getting started (selling) at the very end of this interview. Firstly, please tell us about your plot of land. What is it like, how much of it is reserved for growing flowers for cutting? We have about four acres of land where I would say three of it are left as meadow grass much of the year, where many small mammals live including moles, mice, field mice, hedgehogs etc and pheasants breed. In addition, we have five other main areas. One is the front lawn with deciduous trees and evergreens where lots of birds nest. The area is untouched from one year to another, apart from cutting the grass and me collecting materials to make Christmas wreaths. There is another area where we have a wildlife pond and trees growing, Euphorbia, Aqualegia, shrubs, bulbs etc in an informal way. Next to that area I have my original cutting garden which has beds specifically for growing flowers for cutting. This area is now mainly reserved for perennial flowers for cutting purposes. We have the formal area around the house with hedges, flower borders and patios. Then we have the vegetable borders which also accommodate two greenhouses. I grow Perpetual Carnations in one of them. I also grow tomatoes, cucumbers, peppers, and some cut flowers in one greenhouse and early bulbs in the other, though we do have a third greenhouse waiting to be put up in a field area which is the cutting paddock. This area is about 70 x 60 feet I think, and was established this year after the last of our goats passed away and we decided to use the area to grow flowers for cutting. I also have flowers in vegetable plots, and mixed in with vegetables. This helps to attract beneficial insects. It was my dream to see swathes of flowers when I looked across from the house. How else do you use the land? We let the field out to a sheep farmer who keeps a couple of his ewes and their lambs on it in spring, so for this reason the farmer cuts the grass in late summer after the seeds have set and before he brings his sheep back. What kinds of flowers do you grow? We grow mostly English cottage garden favourites that a lot of people know, but also many flowers that are less well known. 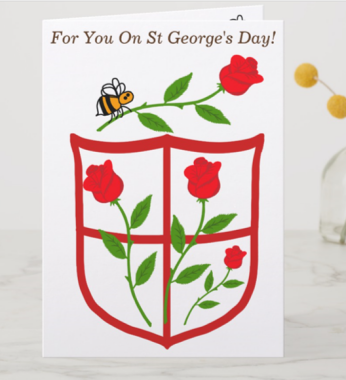 Sadly since the seventies when imported flowers came to this country many British flower growers couldn't compete and folded, and so the abundance of varieties were no longer grown, which meant choice became limited. I think it’s important, if you are going to sell your flowers, to grow the things people can’t get elsewhere. Above: Flowers like pretty jewels! I grow lots of bulbs in early spring, Hellibores, Hyacinths, shrubs, daffs. I have Anemones flowering all through the year, Chrysanthemums in October and November. 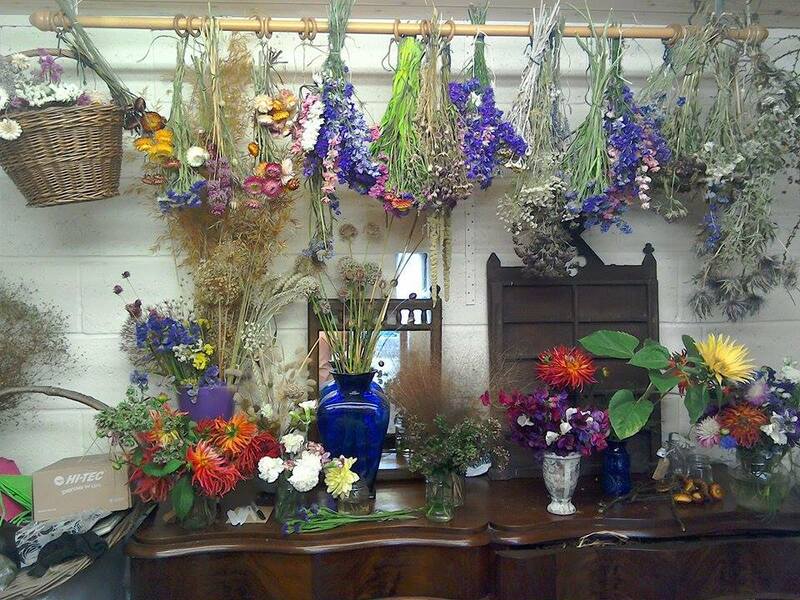 I now dry flowers, much like the Victorians did, so customers can still have flowers in winter. Who are your main customers, and how do you promote to them? How do they get in touch with you? Local people are my main customers. I have a sign outside the house at the bottom of the drive. I find I may sell a bunch for £5, and then later, the customer may come back to me with an order for £15 or £20. I use Facebook to promote my bunches of flowers to local groups over the internet – such as wedding groups, but I don’t trade on-line. I create wedding flowers myself, but if a wedding seems too big or complicated for me to handle, I have a contact to whom I can refer the bride. She’ll handle the wedding, and she’ll use my flowers. I also sell ‘do it yourself’ buckets of flowers, so brides can buy the flowers and have a relative or friend arrange them. Then again, I post pictures of my wedding designs to inspire people. They feature many pretty country varieties not seen in the shops. Florists are starting to find us too. Many people will think it’s not possible to grow beautiful flowers in Britain that are suitable for cutting, because of the climate, but that’s not true is it? Are you growing them from seed/bulb, or are you buying in plants? No, it’s not true. You just have to accept the natural seasons of flowers, but there is always something in season, for example, aconite and snowdrops in winter. I have made simple bunches of flowers with snowdrops and evergreen foliage, and people love them. Plus I find people are getting used to the idea of buying bunches of flowers that are seasonal, and they enjoy it – these flowers welcome in the season, after all. They all have different scents too. Home grown flowers like this are far more scented than heavily cultivated flowers you buy from supermarkets. I grow flowers with unusual scents as well. Some of the varieties of Marigold I grow have a very beautiful and distinctive fragrance, quite different from what people are used to. I do not buy plugs or ready grown plants, I grow everything from seed and I even save seeds from plants. Quite a few of us do this in the small-scale, flower-growing business. For example, I save seeds from Sweet Sultans, Nigella, Cornflower, and Larkspurs. 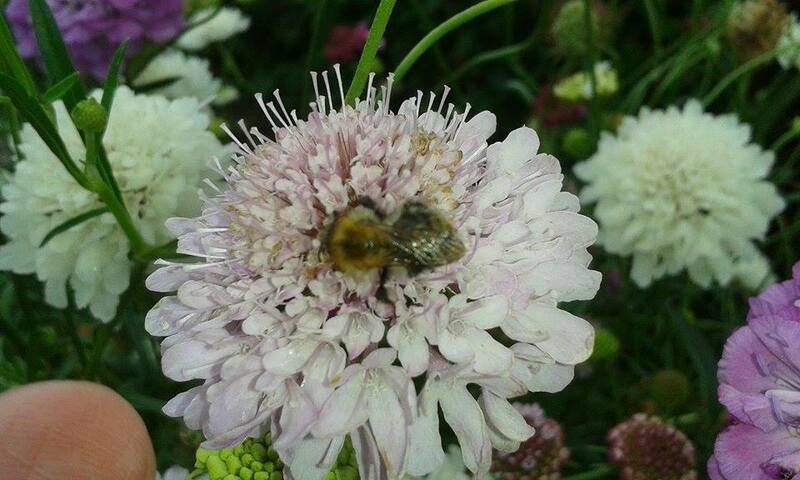 There seems to be a trend in the public wanting to buy home grown flowers, why do you think this is the case? Several reasons. Brides are increasingly wanting the natural look and awareness is growing that buying British flowers offers more variety, scent and even brings more personality to a bouquet. Also, at the Royal Wedding, Kate Middleton went for all British flowers in her bouquet and in the church, and people saw what was possible from British growers. Then there are the older people, who remember the thriving British flower industry in the 1970s, and the amazing variety, before the industry all but disappeared. On top of this, people are learning more about the flower industry, and they are becoming more and more concerned about the environment, air miles, conditions of work, and chemicals use. All these developments have been coming together at the same time. We still don’t have enough growers though. There are not enough people out there doing it, and British growers only supply about 5-10% of the market. How can people locate growers like you? What if florists want to buy British flowers from a sustainable grower? What can they do? Google, British Flower Growers to find a local suppler. 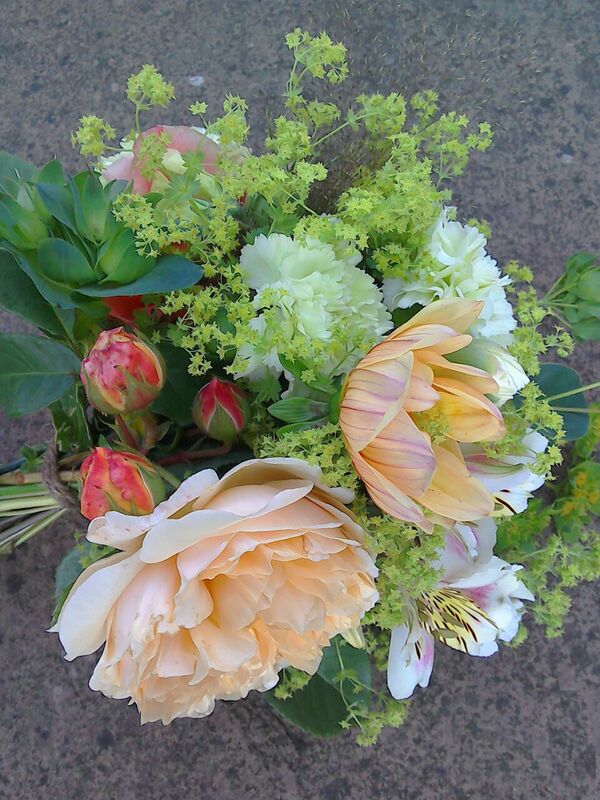 Check the Flowers From The Farm network, and British artisan flower growers. The Dutch grow a lot of flowers, and they have a similar climate to us in the UK. I have noted that they are not all grown in greenhouses either, but there is a lot of mono-cropping, and there is much use of agro-chemicals. 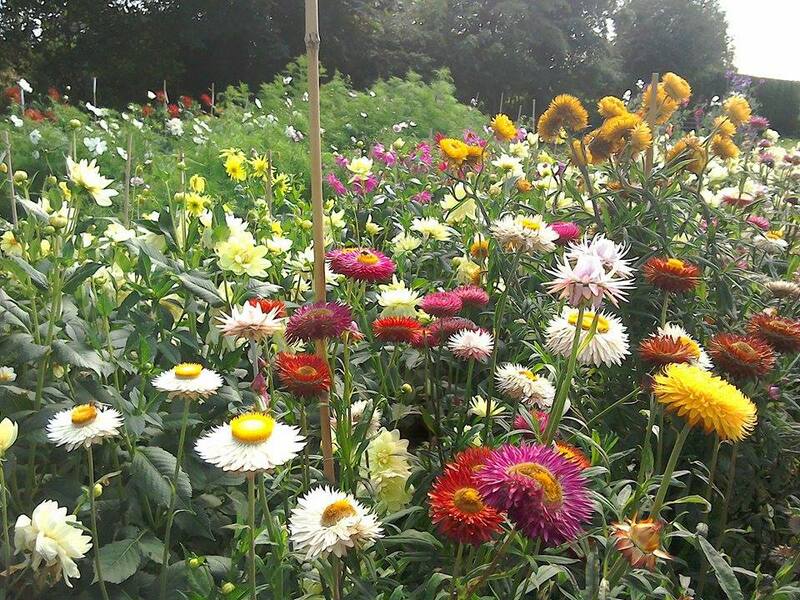 Your cut flower beds are completely different, and are abundant with variety, and the quality is absolutely stunning. Do you need lots of chemicals to achieve this, and how well do your methods work for you? The Dutch use systems such as artificial light and chemicals, which creates an artificial growing atmosphere to provide year round flowers. Growing things in a sustainable, wildlife and environmentally-friendly fashion is more labour intensive. For example, I grow 100 lillies, and to look after them is very labour intensive, because I have to remove lily beetles by hand. They weren’t indigenous to this country, but they have spread rapidly since the 1980s. I have had to learn all about the life cycle of the lily beetle so that I can control the populations without spraying the plants. We are a nation of gardeners, and it's one of Britain’s best loved hobbies. 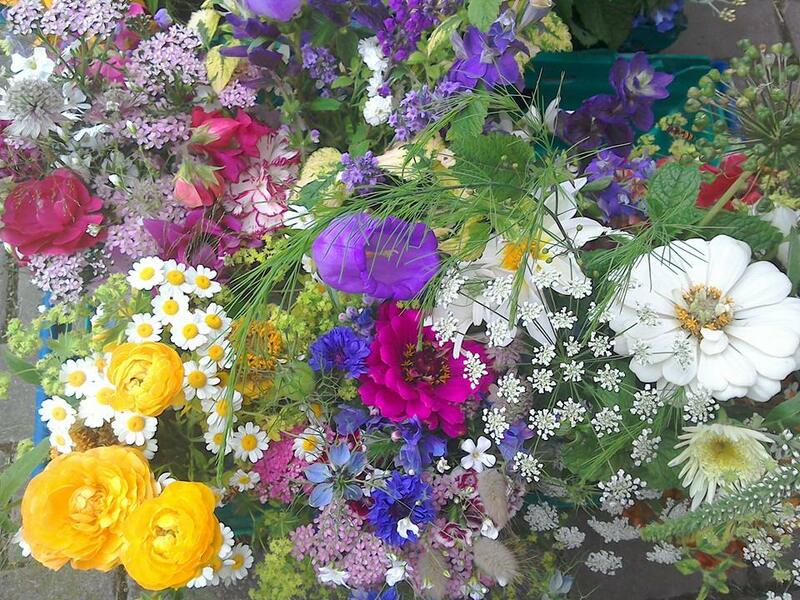 What practical tips would you have for anyone toying with the idea of growing a few flowers to sell? What are the best cut flowers for a gardener? - Grow flowers not commonly seen in supermarkets for example, Phacelia, Sweet Sultan, Nigella, Scabious, Zinnia as well as unusual varieties of flowers. Other than that, also try to grow for scent, because it's important. 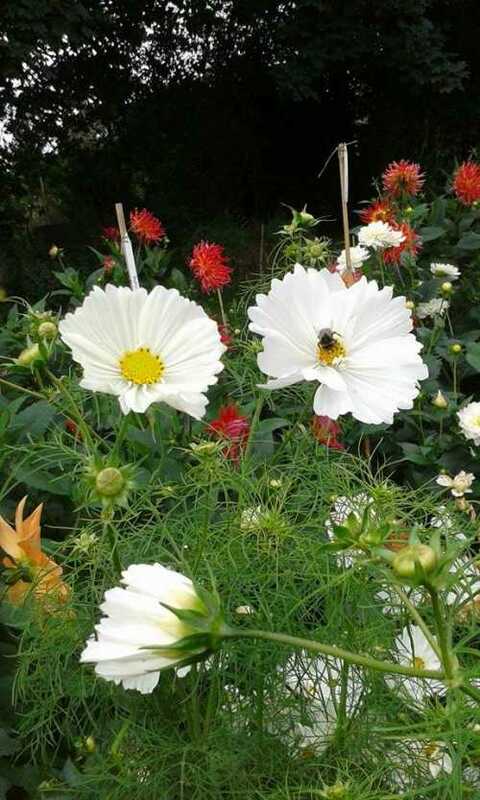 - Buy a few cheap annual seeds first, such as Cosmos. They are great for cutting and you can collect the seeds for the following year. Look for the ‘Ideal for cutting’ scissor logo on seed packets. - Do not cram flowers into your flower bed, space them out properly. It’s better to grow a few plants in a small space, as the yield and quality will be better and you’ll have lots of flowers if you dead head them. - Go with the flow of the seasons, but remember you can do a certain amount of successional sowing. - Check the heights on the packets, and plan your beds accordingly. Follow the growing instructions. - Remember you can grow some flowers for cutting in pots, and also within vegetables and fruit. This will bring beneficial insects to your food crops as well. - Protect your skin. If a plant has a hairy stem, use gloves to handle them as too much handling can cause skin irritations. The same goes with some sappy stems, such as Euphorbia. - Whilst growing, water properly, and give them protection from wind if necessary. 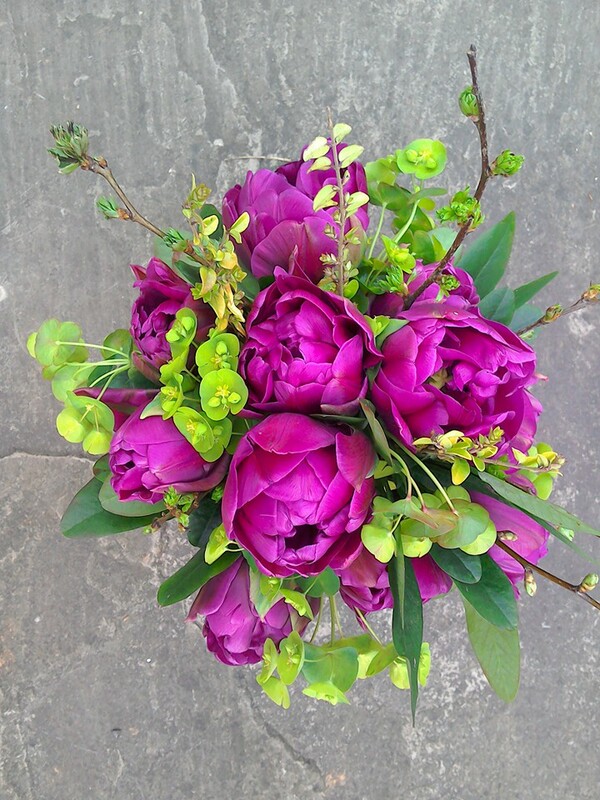 - Get to know local florists, and find a florist who will work with your flowers. - Learn how to condition your flowers. This is very, very important as it makes all the difference in how long the flower lasts. It’s not always a case of simply cutting a stem and popping it into cold water, and it’s handy to know how to revive flowers if they wilt. Highly recommended is this book The Flower Farmer's Year: How to Grow Cut Flowers for Pleasure and Profit which teaches you how to grow and condition flowers for cutting. The book is written by a flower farmer and florist. What kinds of arrangements can you make for brides, or are the types of arrangements limited? Do the flowers last, or are they going to wilt within an hour? Brides need flowers to last a few hours, after all. Florists can get far more diversity using British flowers, and this enables florists to be more creative, and everything can be made, from the bridal bouquet and button holes to table decorations. If British flowers are conditioned properly they can last longer than shop bought flowers, because they have not spent days travelling. In theory they can be seen by the bride a couple of days before the wedding, and picked the day before for conditioning. My peony double flowering tulips last 10 days. 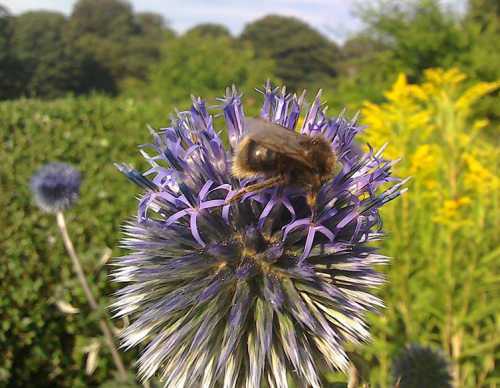 I’m interested in the positive impacts for wildlife and the environment and especially bees. 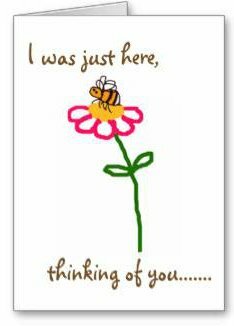 Some people may think the flowers are cut before the bees have a chance, but that’s not true is it? You seem to have bees all over the place. What sort of wildlife visitors are you getting? 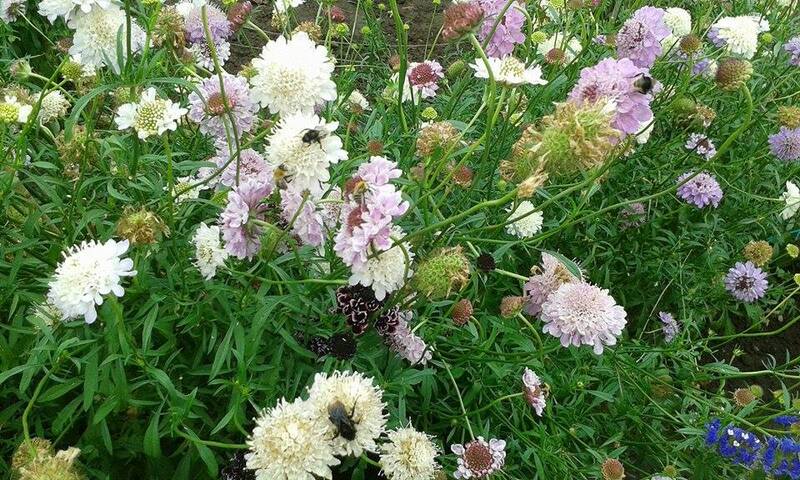 My plot is abundant with hummingbird hawk-moths, hoverflies, butterflies, bees, hedgehogs, birds, deer, rabbits. Lots of wildlife! So what about autumn and winter, is it all over with the flowers? What do you do then? 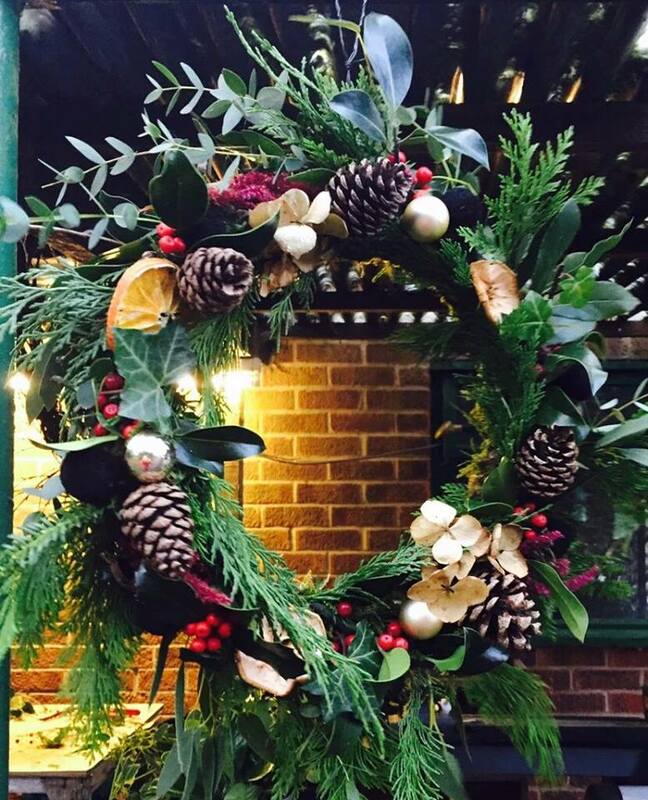 I offer dried flowers, Christmas wreaths and arrangements. How can customers contact you? Best cut flowers for a gardener (loved by bees/pollinators). - Local growers may have a stall at a nearby farmers' market; they may also advertise locally, via social media, newspapers. - If you are planning a wedding or special event, make contact with a grower, and tell them about the date of the event. Will they be able to supply you, and in the colours you want? - If you want the flowers to be prepared in advance (e.g. a bouquet as a gift, a table arrangement or wedding flowers), check the grower can arrange them for you, or whether you'll need to find assistance to have the flowers arranged. - Have in mind a budget, and confirm it. Pay a fair price. - Be as flexible as possible. 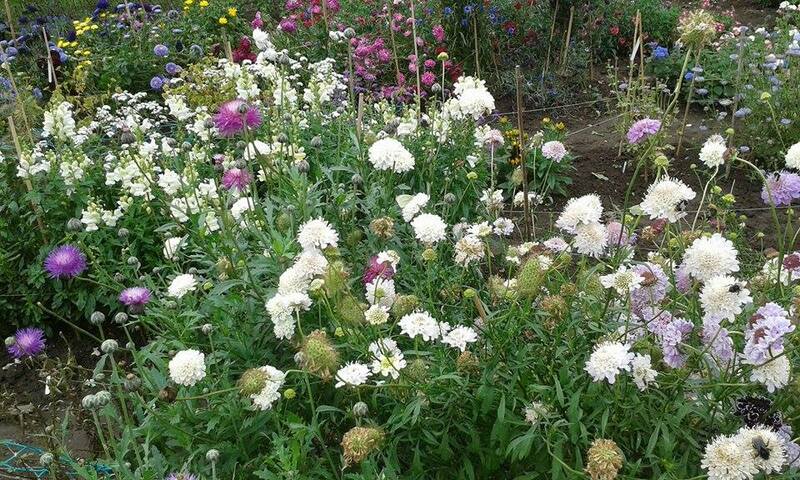 If you want a pretty, country cottage garden look, then allow the grower to supply what they can naturally grow. If they are skilled in arranging, allow them free rein as much as possible, because if you like their arrangements generally, you are more likely to be happy with the result. - There is no use insisting on the perfect rose in a particular colour, if the grower cannot guarantee it. If that is what you want, go to a commercial florist, who can buy flowers out of season from overseas. Flexibility is key. 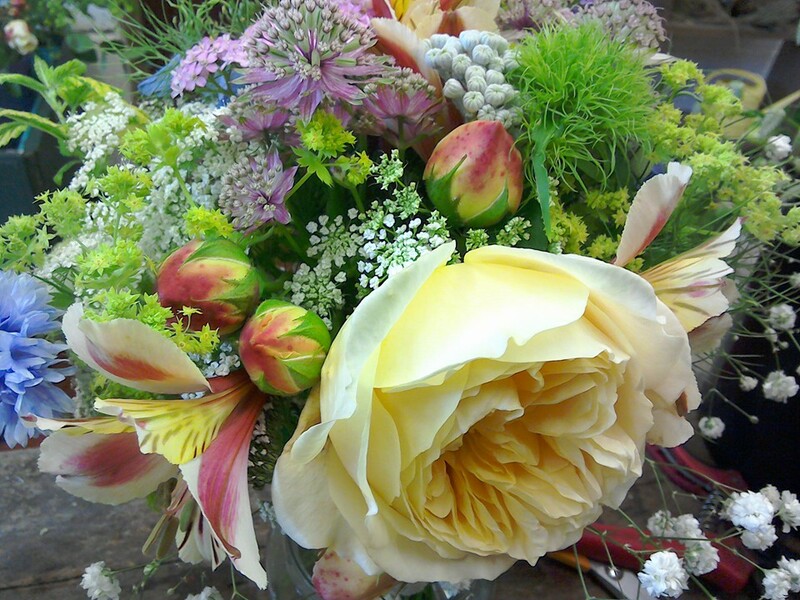 - Again, if you are sourcing British flowers via a florist, be flexible. However, if going to the florist directly, be sure they understand your interpretation of British grown country garden flowers, if that is what you are after. 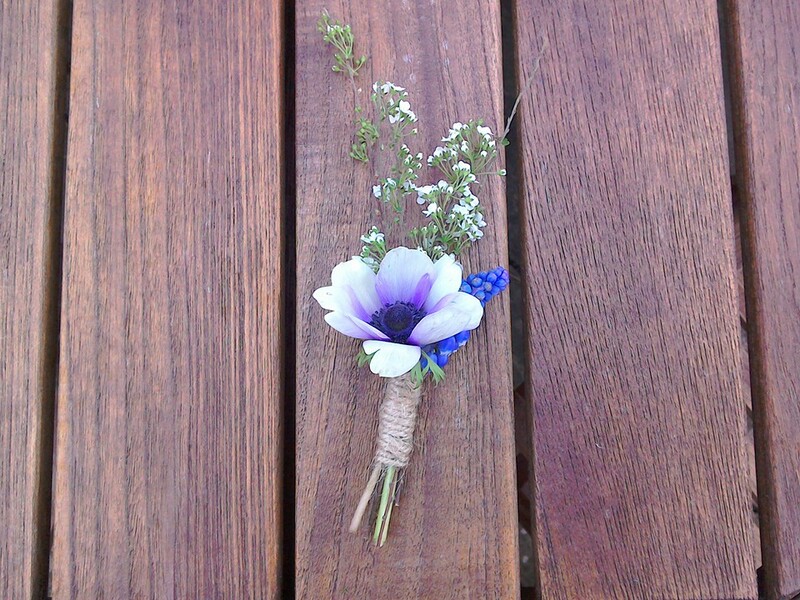 You can check this by ordering a hand tie for yourself in advance of booking for an event. You may wish to sell a few cut flowers in a small way, or make it a full time income. It may be best to start in a small way first, to keep your costs low whilst you are feeling your way around the market. Visit the market first, and see whether there is scope for a cut flower stall. What is the foot-flow like? Contact the market organisers, check the requirements for a stall: Is there a cost? Are there regulations or a protocol? Is a stand provided? Is there access to water? How will you take payments, and will you need to take petty cash? What time do you need to set up your stand, and at what time are you allowed to dismantle? If necessary, is there scope for sharing a stand at first, or even helping on another stand in exchange for selling a few flowers to test reaction? Remember you will need a certain amount of equipment: buckets (for water and displaying your flowers), tie string, scissors, wrapping, secateurs, sellotape (for the wrapping). Remember, your flowers need to be cut and conditioned properly, ideally the night before to give them a good drink. 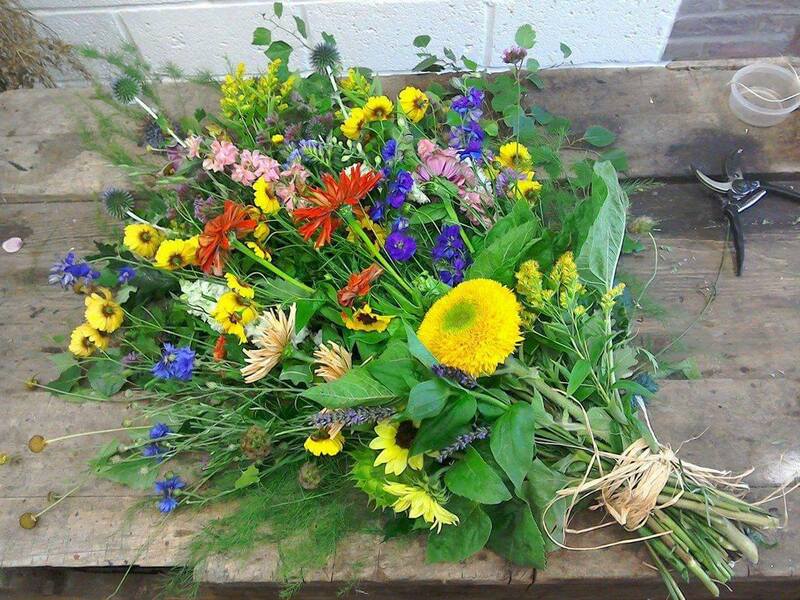 Make a number of flower bunches in advance, at different price points: say £3, £5, £10. 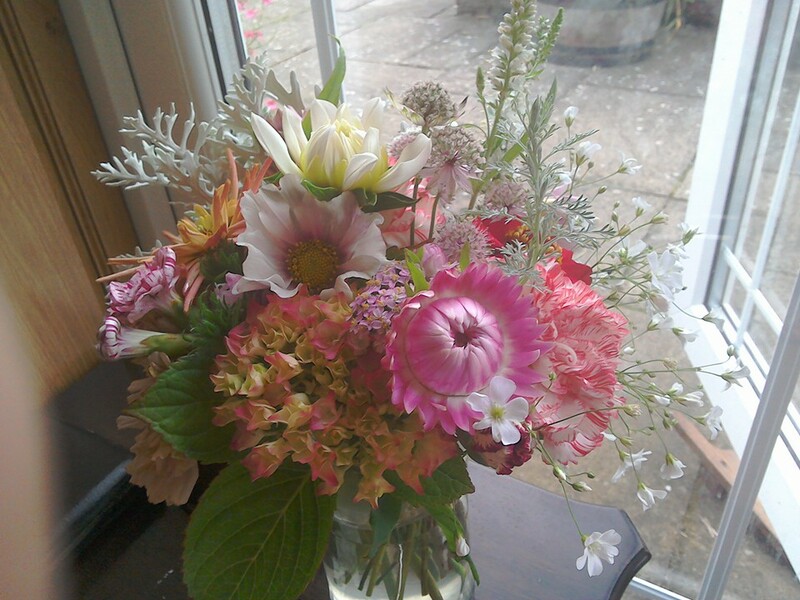 If some-one wants to buy a £20 bunch and you do not have one, obviously, tie 2 £10 bunches together. Keep wrapping simple and "country" in style, and if possible, try to add a personal touch: a little raffia bow, a small piece of dried stem (such as lavender, wheat or berries) tied into it. Look out for little bunches of ribbon for sale in bargain shops, and recycle ribbon and raffia from gifts you have received from others. Link into the farmers' market and local social media groups, take some pictures of your bunches, and post them there, letting everyone know you'll be at the farmers' market. Remember to tell people how much your bunches of flowers cost - people want to know! You could sell your flowers via the internet. An advantage here is that you can cut the flowers only when the order comes in, and potentially send them all over the country. You'll need to factor in the cost of postage and packaging, plus any extra items for keeping the ends of the flower stems moist, for example, with gel in cellophane secured around the ends of the stems. Take into account that some flowers may not travel so well as others. You'll need to provide clear instructions to the customer with regard to recutting the stems, and placing in water. You'll also need to think about how you may cope with complaints due to damages, goods going missing, complaints whether justified or not, cancelled payments, refunds, bad reviews etc. You'll need to factor in the cost of building the website, hosting, and if you cannot get organic traffic, then the cost of promoting your website. Get to know a couple of florists, visit them with a few of your bunches, and let them know what you have to offer, and what is coming up. Develop an email list, so that you can inform them about "What's ready now". You could ask them to order via email. Be ready to tell a florist your prices. Florists will probably want to buy your flowers in a set number of stems for them to arrange themselves (e.g. 10 stems of larkspur; 20 stems of cosmos). Florists may wish to buy foliage as well, if you have it. Pick and condition the flowers, and inform the florist about how the flowers will be delivered to them. Be clear about credit. A florist may not pay you up front, but may be prepared to pay you in a week or two. You need to decide on your credit terms and be clear from the start. You may wish to put a notice in your front garden, or use social media to simply sell to the public. Depending on the area in which you live, some people find they are happy to display ready made bunches with an 'honesty box' on their driveway. 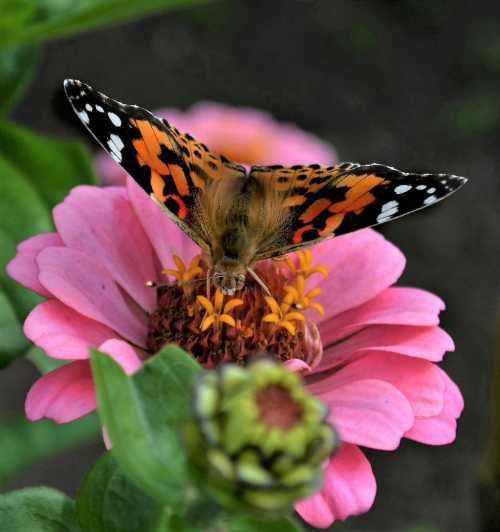 There are many to choose from, but this selection is based on value to pollinators (especially bees), and covers country garden style flowers and herbs for growing outdoors only, rather than exotic blooms for the greenhouse. This list does not include shrubs, trees or foliage.